I predicted changes for February 4-8, 11-15, and 17-21. Here’s the plot of temperatures, rainfall, and mean sea level pressure for the 10 sub-tropical Queensland sites I monitor. 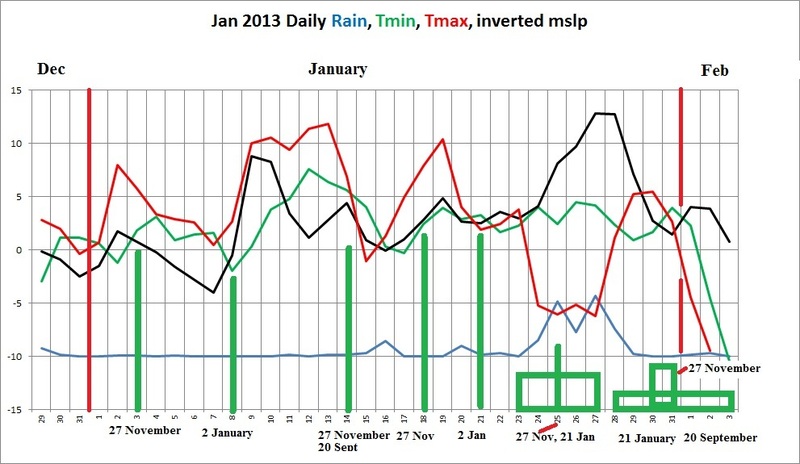 I’ve marked the expected dates for weather changes in green, including the range. All changes were within the time periods I predicted- but I’m not happy with last week. There was definitely a change on February 13 with cooler, cloudy weather on the coast as expected, but the plot shows a change on February 11 (still within the predicted range) that seems separate. I missed this one through inattention to small details. While the rain and pressure matches the predicted event peaking February 19, this was a little earlier too- Tmin peaked on February 16. Possibly this shows in the data because there was a combination of two separate inland and coastal systems, and a blocking high in the Tasman Sea kept feeding cooler, moist winds onto the coast. Therefore I’ll claim 10 out of 10 correct predictions for the year, and count one missed change on the 11th. Changes were at the right times but appear to be preceded by ripples. Was this a chance disruption or is there a permanent shift in timing, perhaps co-incident with the changing seasons (as the indicator I used was the temperatures back in mid-September last year)? If the latter is the case then we can expect all events for the next couple of months to be a couple of days earlier than predicted. In any event I am going to keep a closer eye on inland vs coastal parts of the region. I’m having trouble interpreting data for March. Unstable conditions I think with frequent small changes from 24 February to 16 March. 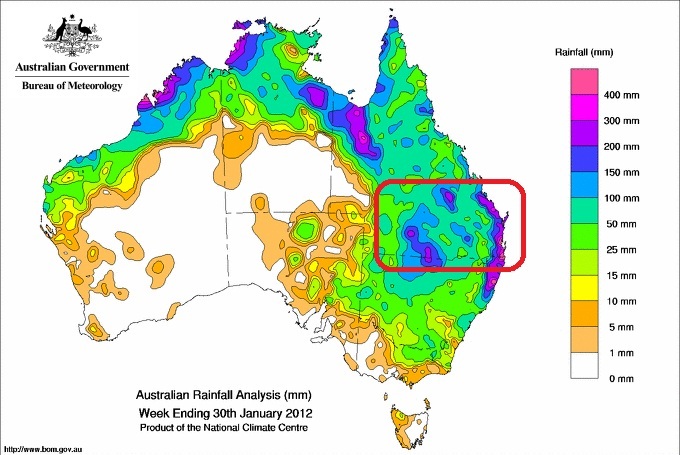 Is this the rather late wet season? The monsoon is certainly strengthening again. Cluttered, isn’t it? That’s what my “model” tells me. And to those who say I can’t be wrong because so many days are covered- I can be wrong indeed if the weather is stable and clear with few changes. 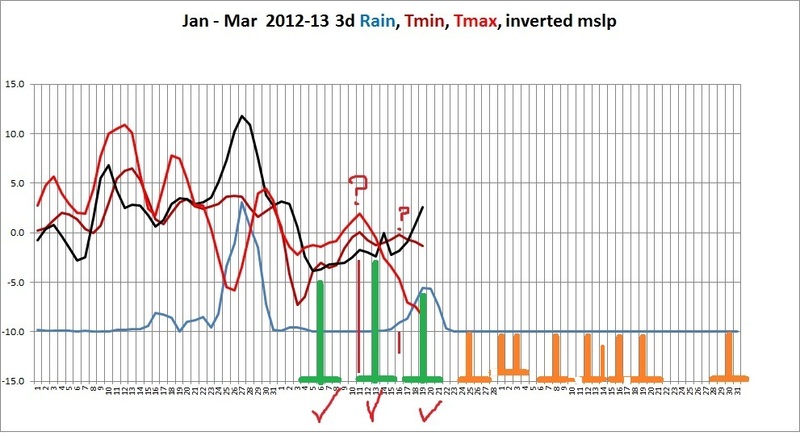 For example if there are no changes/ rain events between March 6 and 21 I’ll be wrong 3 times. It’s easier to prove me wrong than right! And indications for July are 16, 21, and 26. More learning. In this post I show how Tmax behaves, and how it can be an indicator of change but isn’t necessarily a predictor. Here’s the January – March plot of the 3 day Tmin , Tmax and 3d rain anomaly indices, with the 3 day mean sea level pressure (scaled and inverted). I have made a small change- 3 day means are now centred. Predicted dates to watch are in green. I have also graphed the actual one day data (without smoothing) for the month of January with the last 3 days of December and the first 3 days of February, which shows daily changes much more clearly. The 8 January change is visible. Changes can show up in Tmax as a drop in temperature, but not always. I’ve also indicated when the predictions were made. Here is a graph showing readings at my own (admittedly cheap and imprecise) weather station for January near Rockhampton. Relative Humidity and Pressure are scaled. Note the changes in temperature and pressure especially. A running temperature plot would be ideal for monitoring weather. Unfortunately I can only find 72 hours of data for BOM stations. Also note the small events around 18-19 and 21, and then the enormous pressure change and rainfall surge visible in the previous graphs, as the tropical depression from ex-TC Oswald moved through the region. The rain started in Rocky on the night of 23 January, and continued further south through to 28 January. What was my prediction again? Oh yes, 23-27 ( on 21 January so not exactly a difficult prediction); 25 +/- 5 days (27 November– hmmm! ); 22 +/- 2 days (20 September– check it! As was 14 January!). For the year so far, 7 changes predicted, 7 out of 7 identified – and 3 of these were predicted 4 months previously. -I no longer quote uncertainties of +/- so many days (see 21 January post) but give a time period in which a weather event will occur. -If you look at the predictions I made, you will see that all predicted weather events occurred well within 2 or 3 days of the date I specified, and most of them exactly right. -I am trying to impress on my readers that weather is not random or chaotic: we just don’t understand it well enough yet. Rain occurs because it is part of a weather system, not through chance. 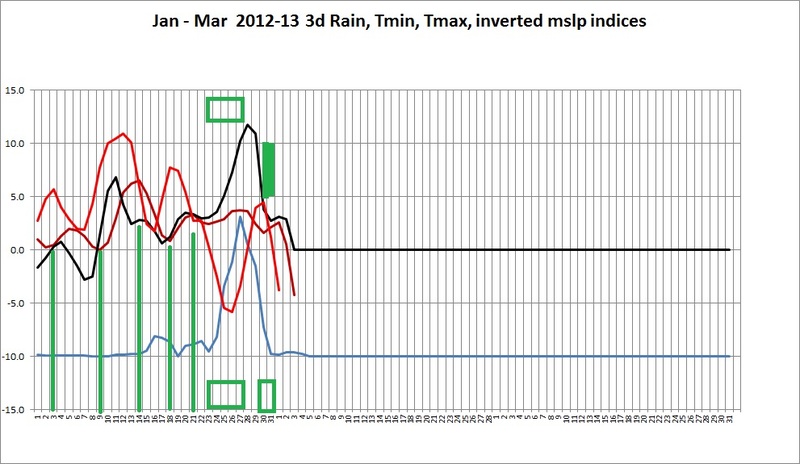 Weather events are discrete and usually can be easily identified so can be matched with predictions. There will not be weather changes on every day of the month- they are usually 6-7 days apart but can be as close as 2-3 days apart. I can predict weather events for sub-tropical Queensland with a fair degree of accuracy more than four months ahead, and can increase the accuracy about five weeks ahead. I am now confident that my method gives an accurate forecast: however the dates remain approximate as we are talking about a weather influence making 4 complete orbits of the globe, and systems frequently slow down or stall. In certain seasons and different ENSO conditions there is more variation. Therefore, I will give specific dates (in bold) but within a short time period. Some are certain to fall outside these limits. I’m having trouble interpreting data for March and April. Unstable conditions I think with frequent small changes? SOI 30 day mean (to 2 February) is -2.8 (neutral). Weekly NINO 3.4 Index (to 27 January) was -0.26 (neutral). The Indian Ocean Dipole (to 27 January) was -0.09 (neutral). You are currently browsing the kenskingdom blog archives for February, 2013.